A cricket loving country like Pakistan which is famous for producing fast bowlers at will. Pakistan’s uninterrupted supply of fast bowling starts with its very first international series when in 1952 duo Fazal Mahmood and Khan Mohammad took the field for Pakistan. The supply continues with unearthing the talents like Sarfaraz Nawaz, Imran Khan, Wasim Akram, Waqar Younis, Shoaib Akhtar, Umer Gul, Mohammad Asif, Mohammad Amir and this list goes on and on. When you have too many options than some talented bloke may miss out but when you have had performed like left arm pacer Sadaf Hussain and went unnoticed than this is more than a bad luck not only for a player but also for the nation. Sadaf Hussain hails from Chakwal which is a district of Punjab in Pakistan. Left arm fast bowler with height measures well over 6ft; made his first class debut in 2009 season for Rawalpindi. Played just 4 matches in first two seasons and captured 21 wickets with one five wicket haul. This was not a performance which can be greatly hailed but 2010-11 seasons became his breakthrough season when he captured 64 wickets in season and topped the bowling charts in Pakistan’s premier first class tournament. Since than his performance graph remains steady and so far he has excellent first class record. In 66 matches he has taken 311 wickets at an average of 18.88 runs per wicket. 22 five wicket hauls and 5 ten wicket hauls shows his consistent performance in a career which spanned close to a decade now. Despite of Sadaf Hussian’s immaculate first class record he constantly fails to catch the eyes of the selection committee. Many faces changed in Pakistan selection panel but none of them able to hear the thundering sound of Sadaf performance over the years. 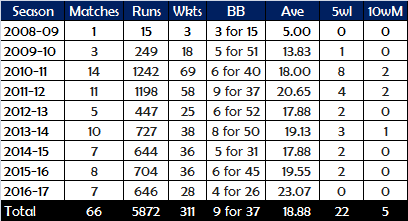 If you compare Sadaf Hussian record with current lot of fast bowlers that got opportunities to play for Pakistan you will find that he stands out with a distance among all of them. He has the best bowling average and strike rate amongst the fast bowlers who have played for Pakistan during last 6 year or so, Even the bowlers with mediocre record managed to get selectors nod but deserving Sadaf Hussain is still in wilderness. 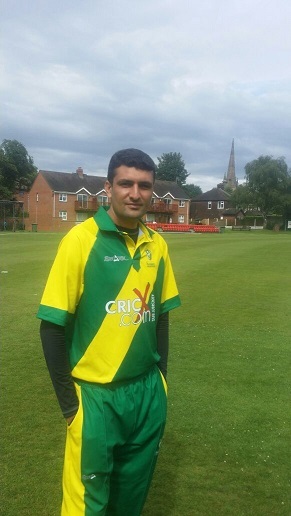 Only Sohail Khan with 29 five wicket hauls has more five for than Sadaf Hussain’s 22. The closest Sadaf came to international reckoning was in 2011 when he was named as a replacement for Pakistan tour of West Indies for injured Aizaz Cheema. Below is the bowling chart of Pakistan’s top fast bowlers in First Class Cricket Sadaf Hussain can easily be seen as the bowler with best bowling average and strike rate. He also grabbed third highest wickets among the current fast bowlers. His outstanding record speaks a lot of his talent but somehow PCB and selection committee is wasting such a talent. As he already passed his 27th birthday Sadaf Hussian has very less time on his side and he have already hinted to play for any other country as he is not getting chances for Pakistan despite of putting up all the efforts . He also had a great limited overs cricket record but somehow he didn’t get a chance to play in PSL or in Pakistan cup; as good performance in these events can easily fast tracked a young guy to international cricket.